Continuous rolls, pre-cut sheets and easy snap sheets are available in different chemical compositions and uniform thickness. Minimum trace levels of impurities ensure reproducible day-to-day results. 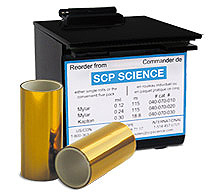 When selecting a film, resistance to chemical attack, transmission characteristics, and purity must be balanced for optimal results with a specific sample type.